« What Does the “Misery Index” Say About Election Results? What’s the Breaking Point for Oil Prices in Northern NE? Because the Northeast is the one region of the country where a high percentage of households heat with oil, high oil prices can take a particularly heavy toll on household budgets in the region. Not all states in the region are similarly affected however. Maine get hits hard because of its weather, the fact that its industrial mix is more energy dependent than say NH , MA, or CT, and even VT. Plus their extensive tourism industry gets hurt when gas prices rise. In NH, a lot of economic activity also depends on travel to the state which is hampered by high gasoline prices, and overall, NH has a relatively high rate of non-discretionary driving (that is we have a bit longer average commutes and a higher percentage of commuters traveling further) that hurts budgets when gas prices rise but our industrial base uses less energy per dollar of GDP than most states (MA and CT are lower in NE). I’ve done some econometric modeling to see how sensitive employment changes are in New England to changes in the price of oil and gasoline. All states are affected by higher oil and gasoline and all energy prices but the MA economy is somewhat less sensitive (the elasticity of employment with respect to oil prices is lower) than any of the Northern New England states. 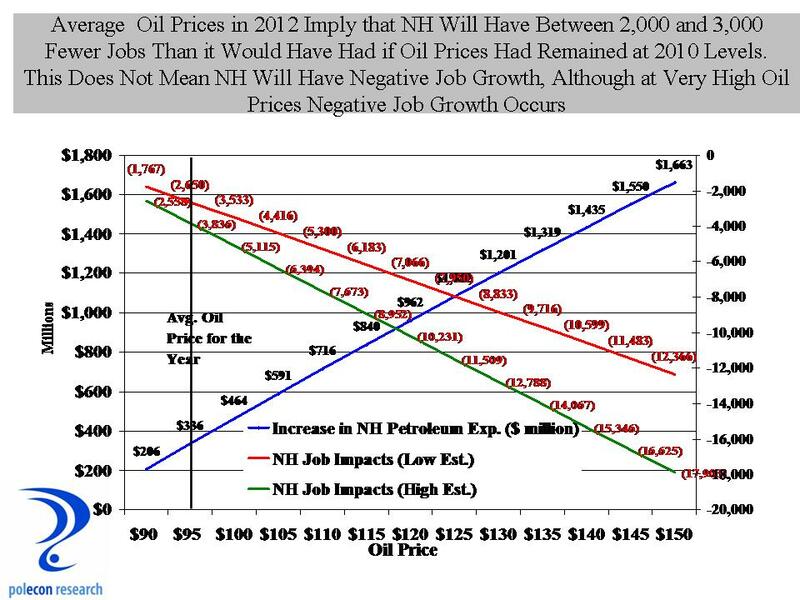 In Northern NE, NH is the least sensitive to oil prices but as the chart below shows, even at current oil prices, or at the average price during all of 2012 (about $96), employment in NH is 2,000-3,000 lower than it would have been if oil prices had remained at 2010 levels. Higher oil prices act like a tax increase on the consumer, reducing disposable income and resulting in a shift in purchases away from some goods and services to pay for higher energy costs. In addition, high energy prices (especially gasoline prices) have a tremendous negative psychological impact on household and consumers confidence and sense of economic well being. How much is too much of an increase in oil prices in Northern NE? At what point do higher oil prices (which largely determines gas prices) tip the region into recession? Based on the same models used above, the point at which slower job gains or actual job losses would occur is probably at a sustained price (for months on end) of at least $130 to $135 bbl. But that changes depending on economic conditions and is also a function of the energy intensity of each state. Strong economies can take more shocks without falling into recession. In a weak economy it takes a smaller oil price increase to induce recession. 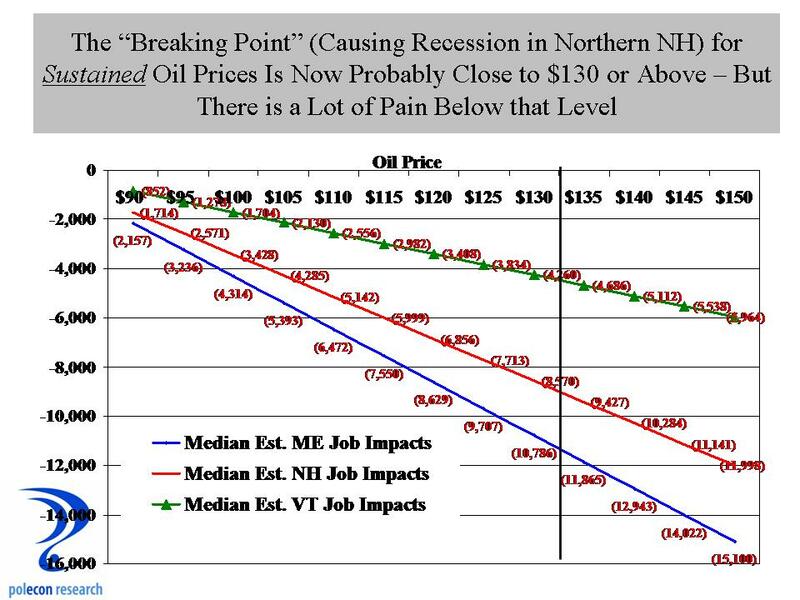 In NH, the breaking point price is now probably closer to $125 – $130 bbl, and in Maine a bit lower, while in Massachusetts, the price that would induce recession is probably closer to $140. This entry was posted on October 17, 2012 at 3:40 pm and is filed under Electricity, Energy, NH Economy, Oil. You can subscribe via RSS 2.0 feed to this post's comments.